The Penguin Guide to Compact Discs (and now also DVDs) awards "rosettes" to recordings its editors have deemed to be of special distinction. Universal Classics has reissued two dozen of these recordings in a series it calls, sensibly enough, "The Rosette Collection." They did something similar with recordings that won awards in Gramophone. Now these seem like flimsy and even self-serving ideas to me, but if they call people's attention to outstanding recordings they might not already be familiar with, I guess no harm is done. 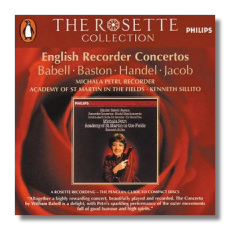 The Michala Petri disc of "English Recorder Concertos" (one actually is a suite) was recorded in 1982, and its LP origins are betrayed by the short playing time. The word "delightful" springs instantly to mind upon hearing this CD. The recorder's cheerfully piping timbre will cure anyone's melancholy – Petri plays sopranino, descant, and treble recorders here. Furthermore, the music is consistently interesting. William Babell (1690-1723) and John Baston (dates unknown, but he lived during the first half of the 1700s) are just about forgotten, and no doubt the inclusion of their rare concertos tipped the Penguin Guide to Compact Discs' editors towards awarding the rosette. Handel's concerto, on the other hand, is quite well known – this is an arrangement of one of his organ concertos. (A version for harp and orchestra also is familiar.) Gordon Jacob (1895-1984) dedicated his seven-movement suite to Carl Dolmetsch, the man who almost single-handedly reintroduced the recorder to 20th-century musicians and audiences. The suite is not unlike Ravel's Tombeau de Couperin in its mingling of the poignant with the vaguely absurd – the fourth movement is a "Burlesca alla rumba"! Sillito and the Academy give the agile and melting Petri excellent support, and while the engineering is warm, it allows the piquantly penetrating characters of the recorders to come through. Here's a recorder CD for anyone's collection! This is one of the most intimate recordings of this opera. Fricsay seldom strove for effect for effect's sake, and his Flute is notable for its serene integrity – like a fairy tale told to children, the outcome of the story is never in doubt. Fricsay's was the first recording to include librettist Emanuel Schikaneder's spoken dialogue – not all of it, but enough to make the plot flow. (Recordings that include all of it prove that one can have too much of a good thing.) Actors are brought in to perform the dialogue; Lisa Otto's Papagena is the notable exception. (Her "little old lady" voice is adorable.) I'm not crazy about the double-casting, but it was pretty much the rule during this era. Stader, Haefliger, and Streich were born between 1911 and 1920, and they were at their peaks when they made this recording. Stader's voice resembles Elisabeth Schwarzkopf's, except it is brighter and less warm. Haefliger nicely blends Tamino's lyric, juvenile qualities with Heldentenor heft. Streich, as the Queen of the Night, is unexpectedly mellow and sympathetic – no demonically cackling coloratura for her in "Der Hölle Rache." Josef Greindl, a contemporary of the aforementioned singers, captures Sarastro's enlightened kindness and wisdom. His low notes are solid and well integrated with the rest of his voice, but it must be said that he has a tendency to sound nasal, and even flat. Dietrich Fischer-Dieskau, somewhat younger than most of his colleagues, is a genial Papageno, eschewing buffoonery. He never sang this role on stage; at 6'4", he was too tall for it! The smaller roles are done strongly. The three boys are sung by adult women, however. 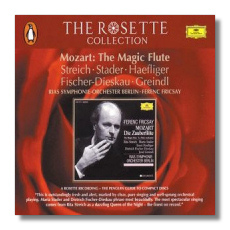 Fricsay's singer-friendly conducting, and his overall sensitivity to the gentleness of Mozart's and Schikaneder's vision are what give this recording its special atmosphere. The monaural sound has hardly aged. A full German libretto with an English translation makes this reissue recommendable even to collectors acquainting themselves with this opera for the first time.